Honestly, I’m here for one reason: Phillip Bradley Bird, director of recent American animation classics The Iron Giant, The Incredibles, and Ratatouille, as well as a visual consultant for The Simpsons‘ Golden Age, making his debut behind the camera of a live-action blockbuster. I could care less about the narrative continuation of Tom Cruise’s international espionage franchise, or the continuation of Tom Cruise, for that matter (dude is 50 years old this year and is due to begin acting his age, elevated Thetan levels or not). The appeal of Mission Impossible – Ghost Protocol lies in discovering how Bird’s wit and flair translate to a non-animated cinematic form (although considering the preponderence of CGI in post-millenial Hollywood pictures, the formerly-firm line between animated and live-action features is now a bit hazier). 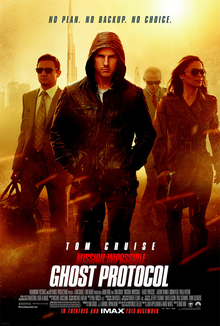 What’s most worth knowing about Ghost Protocol is that Brad Bird does not disappoint, and indeed succeeds wildly. His action sequences are absolute marvels, models of the form, rhythm and flow, pure cinema. It’s worth recalling, when considering his evident enthusiasm for the cloak-and-dagger derring-do of the classics of the spy genre, the clever scenes of Mr. Incredible and Elastigirl infiltrating the villain’s island compound in The Incredibles. Imagine that, only with Tom Cruise and Simon Pegg (the returning comic relief from the last installment, directed by JJ Abrams, who produces this time around) penetrating the secure inner sanctum of the Kremlin. Which Bird then proceeds to blow up, precipitating Cold War-level tensions between the U.S. and Russia and the general atmosphere of high-stakes covert ops that mark the peak era of the genre. The plot is boilerplate espionage stuff, with a Swedish supergenius nuclear strategist (Michael Nyqvist) plotting to ignite a nuclear conflagration, evidently to bring about a post-apocalyptic peace (the ever-virulent Adrian Veidt Syndrome manifests itself again), and Cruise’s IMF agent Ethan Hunt and his cobbled-together team going off-grid and unsanctioned to stop him. Having missed the two subsequent episodes of this series since Brian DePalma’s stylish but head-scratching kick-off in 1996, I didn’t see the significance of Cruise’s film-opening incarceration in a Russian prison nor of the sketched-in backstory of his wife being abducted and killed by malevolent Serbians (are there any other kind of European in these sorts of movies?). It does allow for an awkward, squirmy closing scene in which Cruise attempts to approximate human emotion, but Bird is canny in recognizing that this is not his strength as an actor, or rather as an onscreen being. Playing a ruthless, hyper-trained spy and action-hero killer is the perfect gig for Cruise, in Ghost Protocol more than in any other film he’s tackled of that type. A performer of obsessive self-involvement, he is most effective when he fights against others and takes from them (be it key information, nuclear launch codes, or even lives), because he can give nothing, share nothing onscreen. Cruise is in his own world in every one of his movies, and Bird, like every smart director the star has worked with (I’m thinking of P.T. Anderson especially, who cast him as an elaborate human satire of his forced masculine image in Magnolia), finds a sly way to reference this. He hangs his star from magnetic gloves on the outside of the Burj Khalifa in Dubai, the newly-minted tallest building in the world, a solitary fly-on-the-wall figure above a manufactured metropolis in the middle of an uninhabitable desert. Bird even follows this sequence with a disorienting foot and car chase through the city’s streets and freeways in a blinding sandstorm in which Cruise’s famous mug is swathed in Arabian cloth, a makeshift burka. The movie star is literally de-faced, becoming a literal action figure in another of Bird’s fantasies of physical motion. And what fantasies! Bird’s animation work mixed human soul and thematic intelligence with a chain-reaction visual sense that was no less exhilirating for his prodigious precision. If the script of Ghost Protocol (by Andre Nemec and Josh Applebaum) largely deprives him of the first two elements, it leaves him plenty of room to demonstrate his mastery over the third. Like all great directors of action (and there are relatively few), Bird gives us motion without commotion, physical confrontations like brutal, contentious dances, pursuits that morph before astonished eyes from one location or form into another, seamless transitions from background to foreground and back. Considering Bird’s near-mathematical manipulation of moving objects, it’s none too surprising that he sets the climatic dust-up in Mumbai between Hunt and his Swedish nemesis in one of those new-fangled stacked parking garages which shifts parked cars back and forth on moving platforms like a three-dimensional game of Connect 4. What Mission Impossible – Ghost Protocol lacks in generic invention or compelling performances (it does have the always-interesting Jeremy Renner in a dry run for his upcoming gig as the new Jason Bourne, but not much else), it therefore more than makes up for with a fascinating, fantastic vision of precision. While I’d much prefer for Brad Bird to be given the full box of paints for a movie like this and thoroughly re-invent the whole genre, even under the limitations imposed on him, the director triumphs. Perhaps the film’s success as entertainment and as commercial product (it made nearly $700 million at the box office) will grant Brad Bird that opportunity for a blank canvas. In the meantime, we’ll at least have its multiple sequences of the master at play to savour. There’s nothing like seeing a musical artist live to serve to crystallize your feelings about them and their music, to define the terms and limits of your engagement with them. So I observed upon the occasion of Coldplay’s second Mylo Xyloto concert at Toronto’s Air Canada Centre yesterday. Coldplay is a band that makes overt appeals to earnest emotional exchange with their audience, even while possessing an audience of such a size that it makes such an exchange highly burdensome, if quite nearly impossible. Chris Martin in particular would evidently like to envelop the whole world in a sweaty embrace if only his arms were long enough. Coldplay didn’t so much as ease into or build their way up to arena- or stadium-level headlining gigs as they aesthetically and commercially re-branded themselves as World’s Biggest Band contenders around the A Rush of Blood To The Head era. That art/marketing profile has been updated with each subsequent release and tour, most recently with the colour-splashed graffito and sonically-diverse modern pop of their latest difficult-to-pronounce release. As sincerely passionate as Martin and Co. clearly are about the mass healing powers of popular music, and despite the awkward baby-steps adventurousness of their recent efforts, there’s always been a faint whiff of corporate calculation to Coldplay’s popularity that causes trepidation for those with alternative preferences. It’s not that Coldplay are too big, or that they steal a march from U2 whenever they can (especially evident from the ego ramps, confetti drops, and lighting of their concert tours), or that their cross-collaborations with hip-hop figures like Jay-Z, Kanye West, or Rihanna smack of radio-friendly synergy. And it’s not that they are “artificial” rather than “authentic”, distinctions that lack operative meaning in a cultural setting of post-capitalist hyper-saturation. And it isn’t that their mass gestures are somehow undergirded with implied ironic criticisms of mass tastes and practices, like the Arcade Fire’s music statements tend to be. I suppose one can be moved by Coldplay’s songs, in some way or other, while admitting that, at their core, they are commercial product. This reality is neither disavowed, as in the authenticity-seeking proletarian poses of post-Springsteen rock, nor acknowledged with gleeful post-modern acceptance of its essential shallowness, as in the cases of current pop idols like Katy Perry or Lady Gaga. With Coldplay, there is simple acceptance of the inherent compromises involved with making mass art in the corporate-controlled 21st Century. There’s a lack of judgment, and even a lack of pretension to it that redeems the band from their overwhelming desire for mutual adoration, if only a bit. Musically speaking, of course, such macro theorizing does not always carry through into sonic quality. While singalong ballads like “The Scientist”, “Up in Flames” and the inevitable “Fix You” translate smoothly to stadium settings, mid-tempo outings such as “Trouble” and “In My Place”, while embraced by the crowds, middle their way to the kind of wussified oversensitivity that critics of Coldplay delight in accusing all of their material of embodying. Most tragically muddled are the uptempo cuts of the setlist, masterfully rousing numbers on record like “Don’t Let It Break Your Heart” and “Lovers in Japan” whose complexly mixed elements vanish into the overamplified wash of noise bouncing back off of concrete arena walls. Even in spite of such complaints and Martin’s patented histrionics, Coldplay strives to provide a basically positive collective experience in their shows, and they mostly succeed (they certainly did with set-closer “Every Teardrop is a Waterfall”). Surely, with the amount of resources marshaled for that purpose, one might expect it to work out. But such results are not always guaranteed in the fickle, easily-misdirected realm of corporate-controlled mass entertainment, no matter the production budget. Those who manage to nudge that relentless Mammonist juggernaut in the right direction merit a certain measure of appreciation, and that’s what Coldplay always gets from me. 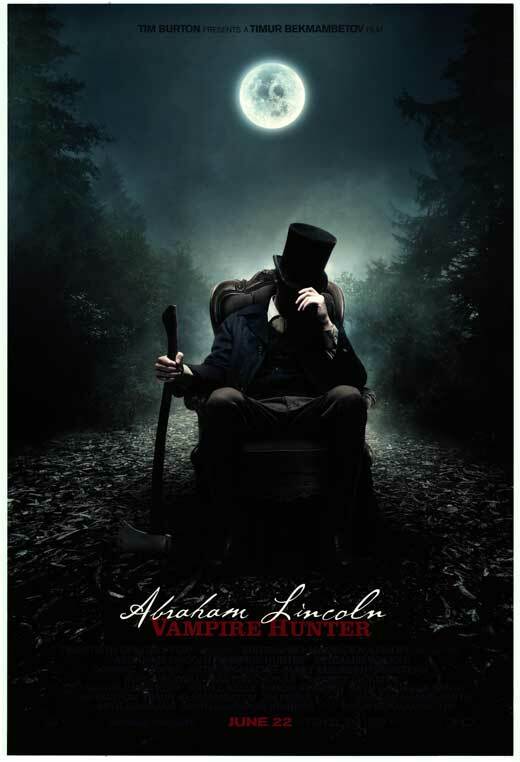 The fantastically-titled Abraham Lincoln: Vampire Hunter was greeted by moviegoers with tepid box office numbers and by film critics with either offhand dismissiveness or calculated offence. Possessing several wildly creative action sequences and buckets of spurting, artful blood, it was generally considered to be a sincerely-mounted collage of genre influences, ludicrous quasi-history, and performances of unconvincing conviction. Even if some of the frenetic visual invention came in for limited praise, the film was generally acknowledged to be every bit the messy exercise that a film about an icon of American history dispatching undead bloodsuckers directed by a former Red Army artillery officer was likely to be. But all of these reactions, you see, totally miss the point. 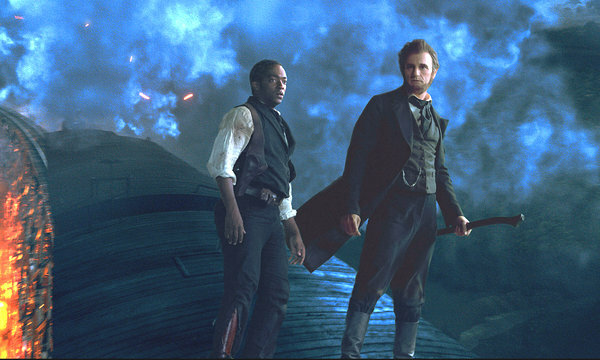 I would humbly propose that Abraham Lincoln: Vampire Hunter manifests as a fictionalized and inadvertent allegory of the distortions perpetrated on historical fact and truth by the popular mythmaking impulse of American culture. Its prevailing contingent argument is that the heroic construction of figures like Lincoln represents the streamlining and paring down of the complex, knotty social and political implications of American history. The very real moral failings of the United States are attributed to literal inhumanity, and the divisive, politically complicated conflict over the nation’s founding sin of slavery is rendered as a face-off between virtuous good and demonic evil. This critique is no less potent for its being cartoonish, ridiculous, and entirely, ironically accidental. Consider the vampirically-tinged perversion of history provided by screenwriter Seth Grahame-Smith, who also wrote the so-called “mashup novel” of the same name as well as the best-selling Pride and Prejudice and Zombies. Vampires rely on human blood to keep them sated in their undead existence, and, in the specific case of Grahame-Smith’s fictionalized antebellum America, they maintain (or at least piggyback on) the slaveholding order of the Southern States to provide them with fresh specimens. It is implied at different points that this exploitation of the human capital of slave-owning societies goes back to the ancient Egyptians at least, and that early vampiric colonists in the New World participated centrally in the large-scale reduction of Native American populations that proceeded from European colonization (it’s not made clear in so many words, but this model could equally be applied to the Nazi Final Solution and to Stalinist purges, should subsequent atrocities be required for dramatic effect). Am I not destroying my enemies when I make friends of them? No, I am destroying them when I strike them with a silver axe! Before being faced with this unholy alliance of slave-owners and slave-eaters in later years, the young Abraham Lincoln (played with near-comic earnestness by the graceful Benjamin Walker) cultivates a personal grudge against vampires from his childhood in Indiana, or at least one of them in particular. Abe’s father Thomas (Joseph Mawle) is in the employ of the sashaying Southern dandy shipper Jack Barts (the scenery-chewing genre vet Marton Csokas), and intervenes in the beating of an African-American boy who is a friend of his son’s. Fired on the spot by Barts, Thomas incurs a debt that he cannot pay in funds, and thus pays with the life of his wife and Abraham’s mother (Robin McLeavy), who is bitten in the dead of night by the vampire Barts. Now a young man, Abraham seeks revenge on Barts for his mother’s death, but his indignance is diverted into vampire-hunting by the mysterious Henry Sturgess (Dominic Cooper), who trains him to dispatch the undead with a silver-edged axe (Abe prefers that to shooting irons, since he “used to be a rail-splitter”). While working in the shop of Joshua Speed (Jimmi Simpson, whose character is never acknowledged as the possibly gay Lincoln’s likely longtime lover) and courting the lovely Mary Todd (Mary Elizabeth Winstead, whose character is never acknowledged to be the daughter of a slave-owning clan), Lincoln also toils at night, learning not only the profession of the law but also that of the secretive vampire assassin. His success at this practice earns him the notice of plantation-owning Southern vampire siblings Adam (Rufus Sewell) and Vadoma (Erin Wasson), who pursue him and those he loves through to his eventual Presidency and the fateful battle for the nation’s soul that was the Civil War. A body divided from its head will not stand, you Confederate bloodsucker! Most penetrating, however, is the critique of the adapted modern view of the Southern slave-owning society contained in the apparently frivolous exposition of its hidden vampiric aims. Americans whose current views are derived from either the Union or the Confederate perspective have likewise always found it difficult to face up to the moral horror of the enslavement of African-Americans, and have long coped in their own ways. Neo-Confederates celebrate a proudly white supermacist social order with commemorations and by stubbornly unmooring its symbols and heroes from the discriminatory ideology they represented; they have founded a litany of institutions to accomplish this, from the Ku Klux Klan and the Sons of the Confederacy down to Civil War re-creationist societies and even the current reactionary incarnation of Lincoln’s own Republican Party. Neo-Unionists have migrated to an Abolitionist stance that few of their general ideological counterparts shared in the period in question, and have lain much of the blame on the aristocratic excesses and inbred degeneration of the South of stereotyped legend. This latter view, the knee-jerk ideology of American progressives, is the one that is reified with unintentional parody in Abraham Lincoln: Vampire Hunter. Slavery is therein rendered as not merely a moral crime but as a demonic aberration from the norm of American society. Never mind that it was the norm of a significant portion of American society at the time of the Civil War, and that it was driven not only by racial absolutism but also that most American of character traits, economic self-interest. The mass responsibility of not only Southerners but also Northerners for an economic regime that reduced human beings to chattel to be bought and sold is thus disavowed in a way similar to that favoured by modern conceptions of slavery. Namely, that slavery was bad and only bad people (in this case, vampires) practiced it. Good people stopped it, and Abraham Lincoln was paramount among those good people. This is a comforting bastardization of history, and one that Abraham Lincoln: Vampire Hunter echoes with a species of goofy, unintentional irony. This critique is only strengthened by association with a non-American outsider (hell, practically a Soviet) like Kazakh director Timur Bekmambetov (who seems more interested in staging spectacular, impossible action set-pieces like a hilarious chase through a horse stampede and the climactic knockdown-dragout on a train hurtling through the night towards Gettysburg with evidently precious cargo). It’s a bit baffling that so many otherwise perceptive film critics could have missed this element so completely. Perhaps they all made the common mistake of judging a film like this on what it sets out to do and then on what it actually does accomplish, when we all know that what is really important is what a film doesn’t intend to do at all. Because Abraham Lincoln: Vampire Hunter succeeds as an ideological critique via its failure as one. Curtis (Michael Shannon) is a Middle American masculine archetype. A working class male in rural Ohio, he’s got a lovely wife (Jessica Chastain) and a young daughter (Tova Stewart), a steady manual labour job with benefits and good buddies to drink with, a house, a yard, a dog, and a truck. It’s the American middle-class dream, more or less. But his reality is more complicated than it initially seems. His daughter is deaf, he’s estranged from his brother (Ray McKinnon), his mother (Kathy Baker) has a history of mental illness and is confined to assisted care, and, most alarmingly, Curtis himself is having dreams and even daylight visions of a troubling, nigh-on apocalyptic nature. In these imaginings (if that is what they are), massive storm clouds gather in the wide prairie sky, tornado funnels forming air quotes at their edges as they disgorge thick, viscous, oil-like rain. Flocks of black birds whirl overhead in ominous shifting clusters before plunging lifeless to the ground, a Biblical plague of the skies. Silhouetted figures assault his car and his house as he tries in vain to protect his daughter Hannah from the threat; in the latter dream, the furniture in his living room is briefly suspended in air as if in zero gravity. He’s attacked in dreams by his dog, his best friend Dewart (Shea Whigham), and is even forebodingly threatened by his wife Samantha in a particularly eerie sequence (the wonderfully naturalistic Chastain works wonders with another stock role). Curtis, a strong, silent type perfectly suited to Shannon’s intense, stone-faced repressed temper, internalizes these anxieties in the best (worst?) stiff-lipped male tradition (his name does begin with “curt”, after all), but their effects increasingly ripple out into his behaviour and destabilize his life. He confines his dog to a pen, misses more and more time and acts irresponsibly at work, and detaches from and lies to Samantha and Dewart and his brother Kyle about the reasons for his actions. More than anything, though, Curtis is driven to expand and improve the subterranean storm shelter behind his home, even at the cost of his career and financial security and his personal relationships, the better to protect him and those he loves from the climatic cataclysm that his visions are anticipating. Take Shelter is the second feature from Arkansas-born director Jeff Nichols, and firmly announces him as a young auteur worth watching. His film is a work of austere and intimate realism that is also a fantastical metaphor for the contracting conditions of American prosperity in the face of the economic crisis and the prevailing sense of insecurity engendered by capitalism without a safety net. This is to say nothing of the national security state’s encouragement of an atmosphere of constant fear and suspicion in the post-9/11 environment, although Nichols’ focus is more on the domestic, in both the residential and political senses of the word. With his very personal sense of secure normalcy deeply shaken, Curtis overcompensates with a siege mentality to preserve it. Has America reacted any differently to its own convergence of crises? Curtis’ mental illness troubles the water of his life, but Nichols’ film is highly adept at dropping hints that the visions are not entirely in his head, and are very real indeed (and at dropping more than just hints of that, as the cracker of an ending demonstrates). With its depiction of bizarre, possibly supernatural happenings in heartland America, Take Shelter is sort of like a M. Night Shyamalan thriller with more subtlety and emotional integrity. That description may deflate it a bit in the estimations of many, but the curious can rest assured that it is meant in the most complimentary and indeed extolling manner possible. Take Shelter is memorably, forcefully tense and involving. If it’s not a new classic of American independent film, then it’s as close as it gets in the modern cinema. 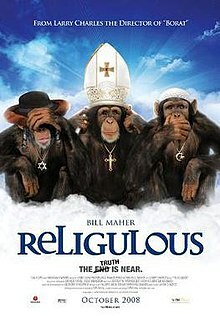 Rationally or even tempermentally, it’s difficult for me to disagree with Bill Maher’s inelegant central points in his clumsily-titled anti-faith documentary Religulous. The mythological underpinnings of every major religion (and most mid-level ones as well) are patently ridiculous, and their beliefs are contradictory when they aren’t openly prejudiced and restrictive (and often when they are). If I can’t quite echo his assertion that religion is a social poison (I’d rather label the Lindisfarne Gospels, the Great Mosque of Cordoba, and the work of J.R.R. Tolkien as cures, of at least balms), the thrust of his arguments and his attempt to shift the Overton Window on the question of belief in America is at least appreciated. But even if I can nod along with Maher’s championing of thoughtful doubt over thoughtless certainty, the way he chooses to express it in Religulous relies on smug, snide superiority and glib dismissiveness. Directed by former Seinfeld writer and frequent Sacha Baron Cohen collaborator Larry Charles (who appears in a scene or two, looking like an Orthodox Jew raised by wolves in the Appalachians), this is a film that very much reflects its star/host/master of ceremonies. Much like his talk shows Politically Incorrect and Real Time, Religulous always has to let Maher have the last word. If he can’t find a way to have it in face-to-face filmed encounters with a rogue’s gallery of unbelievable believers, then he’ll have it afterwards, behind their backs, in the discursive safety of the production’s van. Maher also doesn’t do his subject any favours with his brand of humour. As a comic well into middle age, he too regularly falls back onto the broad ethnic, gender, and subcultural stereotypes of his longtime milieu of late-night Borscht Belt boomer comedy. There are several egregious and even downright racist examples to draw upon to reinforce this impression. But none are less flattering than two interview sequences: the first with a charismatic African-American evangelical preacher and former R&B singer that is intercut with quick-flash blaxploitation clips of ghetto pimps, and the second with a Latino-American millenarian huckster selling himself as the Second Coming of Christ that is punctuated with quotes from Al Pacino as Tony Montana in Scarface. The Jewish jokes are also pretty anti-Semitic in character (Maher is half-Jewish, but that doesn’t give him the carte blanche he thinks it does), and his entire section on Islam is reactionary in the extreme. Religulous simultaneously covers too much ground and too little. The tenets of the American religions, Mormonism and Scientology, flutter by in a litany of wacky factoids, the latter poured out by a disguised Maher as the ravings of a mentally-unhinged Speakers Corner ranter in London’s Hyde Park. Judaism, its denizens so long oppressed and dispossessed, is treated with relative kids gloves; only a radical anti-Zionist rabbi appears as representative of its nutty fringes. Christianity, however, provides most of the oxygen for Maher’s fire of secular indignation, as well as plentiful eccentric interview subjects across America’s Bible Belt. He awkwardly (inadvertently?) comes onto a former gay man who now “cures” homosexuals, and probes at the firmly-held beliefs of a Creationist museum curator, an Ex-Jews for Jesus recruiter who professes to live a life of miracles, and an actor who plays Jesus at a Florida religious theme park called Holy Land. They mostly spout half-literate Evangelical dogma and stare stonily at Maher’s attempted jokes (late-night comics are often exposed without their studio audiences and supplementary laugh tracks). Much more amusing are the pair of Catholic functionaries who agree to speak with him at the Vatican; one is a witty church astronomer who fillets “Creation Science” with skill, the other a realistic proletarian priest amusingly resigned to his church’s nonsensical ecclesiastical concepts. Even if a viewer spend half of the interviews wishing Maher was not such a condescending twit, his vector of challenge leads to some fascinating exchanges and self-justifying defenses of blind faith. Maher begins Religulous sitting in his former church with two of his similarly-lapsed-Catholic family members, speaking with directness about how he lost his faith and came to where he is at. It’s a rare moment of personal honesty from a comic who relies heavily on a tone of priggish know-it-all-ism at most times, as is a later moment of near-vulnerability where he admits to half-praying for divine aid in quitting cigarettes years before. In these moments (the former which recalls Michael Moore’s admission at the start of the anti-firearm Bowling for Columbine that he is a member of the NRA), he scrapes at the surface of possible arguments for the validity of faith: as a key aspect of communal bonding experiences and as a source of solace in times of private anguish. That Maher spends most of the rest of his anti-faith cinematic statement focusing on applying a rational calculus to religious mythology when he’s not openly mocking belief as a harmful mass delusion makes it seem as if he misses the point, to some extent, despite moments of inspired documentary lunacy. In Religulous, Bill Maher shows quite definitely that you don’t need to be sanctified in order to be sanctimonious. Guy Ritchie’s Sherlock Holmes films are a lot of things. They are stylishly mounted, exquisitely designed, delightfully scored, wittily written blockbuster entertainments, nicely acted by capable leads with solid, bantering chemistry and dedicated supporting character actors. The inevitable fisfights, shoot-outs and explosions are choreographed with impressive clarity that actually increases rather than diminishes their excitement level (other action directors should be taking note). And more than anything, the movies are constructed as feverish, steampunk-inflected imaginative mash-ups of Late Victorian culture, society, politics, technology, and design. In this sequel alone, the setting careens from ornate restaurants and gambling parlours to Gilded Age Paris to subterranean anarchist hideouts and bomb labs to ramshackle Gypsy encampments, past an English country church-house and Victorian London drawing rooms onto a steaming night train, through the industrial bleakness of a German arms factory and the bullet-torn continental forests that will soon host a bloody world war to an isolated Swiss chateau poised precariously over a fateful waterfall. In the context of tentpole studio releases, Sherlock Holmes: A Game of Shadows is many things. The one thing it never really is, however, is a Sherlock Holmes story. It borrows characters and relationships, clever foreshadowed plotting, certain narrative developments, and a place and time from Sir Arthur Conan Doyle’s classic stories of the famous detective and his stalwart doctor sidekick. But it is not Sherlock. 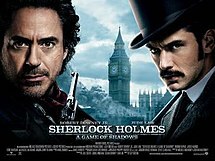 It’s an elaborate multi-million-dollar fan fiction, minus the slash elements (although unlike the first film, Ritchie finds room for a nod to the Holmes/Watson homosexual undertones, with Watson and a cross-dressing Holmes engaged in a suggestively leggy clench before the detective asks his companion to “lie down” with him). If these films did not have “Sherlock Holmes” at the front of them, I could praise them as prodigious entertainments without a second thought. But they do, so I cannot. It’s a shame, because there’s lots to like about A Game of Shadows, as there was about its preceding chapter. Following generally but not strictly on the events of the previous film, this installment commences in the aforementioned Paris, where Holmes (Robert Downey Jr., in full roguish trickster mode) thwarts an attempted auction house bombing involving his female muse from last time around, Irene Adler (Rachel McAdams in a thankfully brief appearance). This thwarting has unfortunate consequences for Adler, as her patron in this incident is the calculating, ruthless “Napoleon of crime”, Professor James Moriarty (Jared Harris, ie. Lane Pryce on Mad Men), and he is none too forgiving of her failure nor of her apparent feelings for the master detective who is his soon-to-be-nemesis. That nemesis is reeling in hyperactive distress at the impending nuptials of Dr. John Watson (Jude Law) to Mary Morstan (Kelly Reilly), which is depriving him of his Boswell, his brother-in-arms. Inviting only his own actual brother Mycroft (Stephen Fry, wonderful if always entirely himself) to Watson’s stag party on the eve of the wedding, Holmes becomes sidetracked by the case as always, speaking with Romani fortune-teller Madame Simza (Noomi Rapace of the Swedish Millennium Trilogy films, her cheekbones virtually swordfighting with Reilly’s for female window-dressing supremacy) and then saving her from a Cossack assassin in a motion-filled fight sequence. After dragging a hungover Watson to the altar (a nice bit of subtle physical comedy) and parleying with a coolly threatening Moriarty in his college office, Holmes must save his doctor friend from a honeymoon murder attempt and then, with Simza’s help, uncover Moriarty’s tangled conspiracy before the Professor triggers an international incident with catastrophic consequences. 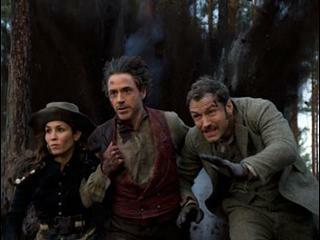 As Downey’s casually frantic and absent-mindedly brilliant Holmes puts it, “No pressure”. The plotting and dialogue (the screenplay is by Kieran and Michele Mulroney) is sharp and creative, flashing back and sometimes forward in order to catch up with or anticipate Holmes’ riffs of intellectual virtuosity. There is some lovely self-aware play with the “Holmes-o-vision” feature of the first film, wherein Downey’s Holmes diagrams each thrust and parry of a fight before physically carrying it out: neither time does his plan pan out as expected, the second occasion with quite dramatic consequences. Still, the titular “game of shadows” between Holmes and Moriarty is not left shadowy enough, and that is a failing. A chess board appears in their initial meeting at the college, and their climactic meeting sees them playing an actual game of chess. The over-literality in which their conflict of wits is couched is not to the script’s credit, although a mid-film confrontation in a warehouse involving a suspended hook and a grammaphone playing Schubert is more memorable, as Harris suggests a chilling psychopathy that his otherwise buttoned-down menace precludes. How about I turn on some classical music and do something crazy? Does that sound nice to you? On a stylistic level, there’s plenty of red meat for the flashy Ritchie to sink his camera’s teeth into, and he does so with relish. The pursuit through a Teutonic forest in particular, with Holmes and his compatriots dodging the entire multifarious arsenal of an arms plant, offers plenty of chances for the director and his team to show off from a technical and aesthetic perspective. The shutter speed slows and quickens with muscular poetic bravado, showing bullets skimming waistcoats and shells splintering pine tree trunks. After this stunning visual sequence, the climax at a diplomatic ball is a bit of a letdown, although it does privilege detection methods over fists for once in the course of the films. This last point, I think, is the essence of why Ritchie’s films cannot quite aspire to the Sherlockian mantle, despite all there is to recommend them otherwise. The cinema is a visual medium first, and Ritchie a visual filmmaker far before he is a coraller of actors or a lassooer of language. Thus, this Holmes’ brilliance manifests in physical ways, in the schematics of violence and the details of disguises, moreso than in the spheres of intellect and logic that are focused on by Conan Doyle. This is not only a simpler and more accessible way of rendering the rational exercises of the canonical tales for a mass audience, but it makes ample sense on a visceral level and for the particular actor portraying Holmes. For all of his gifts with delivering dialogue, Robert Downey Jr.’s career rennaissance has had much to do with the renewed mastery of physical detail that gained him notice in Chaplin in the first place. But A Game of Shadows reinforces the fact that Ritchie’s Sherlock Holmes films are derived from a certain set of assumptions about what Conan Doyle’s seminal detective stories are all about. With their complexly organized settings of the Late Victorian milieu and colour scale of greys, blacks, navy blues, and browns, these films make it clear that what their crafters find most notable and appealing about the Holmes tales is their time, place, mood, and tone, rather than the demonstrations of rational prowess that their author intended them to be. One can never help but contrast these recent Hollywood adaptations of Sherlock Holmes with the popular BBC television versions set in the present day that are their direct contemporaries (the first series of Sherlock followed the initial Sherlock Holmes‘ release by 8 months, and Series Two began airing a mere two weeks after A Game of Shadows came out). But it is not temporal conjunction alone that sets these two adaptations against each other, but overarching philosophy as well. Where the films come from the aforementioned direction of physical manifestations and socio-historical location, the television version moves the stories out of their Victorian milieu into the modern day while also engaging in more complex intertextual interactions with them. For the creators of the BBC Sherlock, the Holmes canon is about the mind, while for Guy Ritchie and Warner Brothers, it is about the eye and the body. I think I have made it clear in this blog space where I stand on this dichotomy of the intellectual versus the corporeal, but it’s up to each Holmes-interested viewer to decide where they position themselves on this question. Historian Dominic Lieven warns in the introduction of Russia Against Napoleon, his monumental opus on the Russian Empire’s defeat and deposition of the French Emperor and master general from 1812 to 1814, that the sort of historical study he is about to engage in for upwards of 500 pages is not considered very fashionable by the academy. Obsessed as current progressive-leaning university history departments are with representing the experiences of the more ordinary denizens of society in the midst of historical upheavals as well as understanding the systemic operations behind historical change, Lieven feels that something has been recently neglected. In his view, the saga of the Napoleonic Wars, in particular the struggle between Bonaparte and his Russian counterpart Czar Alexander I, is best expressed in historical terms as a contest of aristocratic planning and military prowess, areas of study that have been missed by the more sociological approach to history that now predominates. Most of what I knew about Russia’s defeat of Napoleon I learned from Leo Tolstoy’s masterpiece War and Peace. It’s reasonable to assume that this is generally the case for those who claim some knowledge of the conflict. Lieven certainly assumes this as well, and it most certainly sticks in his craw. In between Tolstoy’s intricately, lively details of quotidian life before, during, and between Russia’s wars with Bonaparte (the novel’s true measures of greatness), War and Peace is marked by lengthy philosophical diatribes about the nature of warfare and the role of human agency in the flow of historical development. Tolstoy, mainly targetting the Great Man theory prevalent in 19th century historiography, denied that human actors had any purposeful role in defining the unfolding of events in the case of Napoleon’s invasion of Russia or any other large-scale happening. Tolstoy is a little vague about what exactly does direct history, but it seems to be down to a combination of fortune, environment, pre-existing social and cultural circumstances, and other forces beyond the understanding of mere mortals (divine ones, apparently; the Count did end his life as a bit of a God-fearing cult leader, after all). Although Lieven acknowledges Tolstoy’s magnificent ability as a novelist, he takes issue with this conception of history. He argues, with some evidence to back him up, that Alexander and his on-again, off-again commander-in-chief Mikhail Barclay de Tolly conceived of and executed a long-game strategy that sought to draw Napoleon into a long war of attrition on Russian territory and then pursue his depleted forces all the way back to Paris and overthrow his predatory regime. The narrative of how this strategy was implemented is indeed a dramatic one with plenty of military, logistical, and diplomatic challenges to be overcome, and Lieven tells it with meticulously-researched detail. What he does not tell it with is excitement, empathy, or deeper psychological insight. In other words, he doesn’t tell it like Tolstoy did, even if he follows the Russian armies into Europe when Tolstoy left them at the vast empire’s Western edge. Although Tolstoy’s historical methodology was not exactly rigorously arrived at, his ideological approach to history anticipated that which was eventually favoured by the academic historical mainstream. Lieven is reacting against this hegemony of sociology and psychology, and doing so from a very conservative place. In his hands, military history becomes an annal of the exploits of aristocratic gentlemen-generals, every victory in every skirmish explained, essentially, by manly courage. Perhaps this is what military history always is. Perhaps those who have flipped through the volumes upon volumes of war history on their uncles’ bookshelves could confirm that, as it remains a mystery to me. But it makes for a highly tedious read in this case at least. Lieven does provide some compelling character sketches of the major players on the side of Russia and its allies along the way, even if he is clearly in the tank for the enigmatic, pragmatic (Obama-like?) Alexander and the stubborn, often-unpopular Barclay de Tolly. The brief author’s biography reveals that Lieven named his dog after the latter, even while remaining entirely silent concerning his descent from not one but two Baltic German nobles who play roles in the Russian war effort. His historical objectivity is therefore in some doubt, although the patrician Lieven evidently comes from an intellectual tradition that substitutes the birthright of nobility for such bourgeois affectations as objectivity (much like the historical dilletante Tolstoy, in this way at least). Whatever the politics of his position of historical authority, Lieven mixes intricate knowledge of the basic structure of imperial Russian society (the logistical chapters are fascinating, if a little dry) with mind-numbing directness in rendering the criss-crossing movements of armies across landscapes and eventually into each others’ paths. 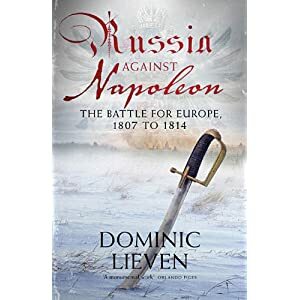 The basic problem with Russia Against Napoleon is that Lieven commences by telling us that everything we know about Russia’s wars with Napoleon is wrong, and that Tolstoy made it that way. Once this is done, he proceeds to demonstrate that being historically right is insufficient fodder for a great historical narrative. Even if Lieven is accurate and Tolstoy is not, I’d gladly pick up War and Peace again before suffering through another salvo of this sort of history.